Water, Carbohydrates, Proteins, Nutrients, Vitamins, Food Groups, Minerals. Do you ever feel like you can't keep up with the changes in technology? Sometimes it seems that way with dietary advice, as if things are always changing. While it's true that the fields of diet and nutrition are areas of evolving research, there are some basic concepts you can keep in mind. By knowing these basics, you will be better equipped to sort through nutrition research and dietary advice. You may have grown up with the "Basic 4": dairy group, meat group, grain group, and the fruits and vegetables group. As nutrition science has changed, so have these food groups. This section helps explains food groups and provides some healthy eating plans. Water is is involved in every function of the body. It's in every cell, tissue and organ of the body. In this section you'll learn why getting enough water everyday is important for your health. Whether you're looking for information about monounsaturated fat, polyunsaturated fat, saturated fat, trans fat, or cholesterol, you'll find what you need here. You may be wondering what all the hype is about carbohydrates or "carbs" as they are often called. Find out the facts. Then there's protein. How much do you really need? Can you get too much? You'll find answers to these questions and more by visiting this section. Vitamins and minerals are nutrients your body needs to grow and develop normally. The NIH Vitamin and Mineral Supplement Fact Sheets provide information about the role of vitamins and minerals in health and disease. Please note: Some of these publications are available for download only as *.pdf files. These files require Adobe Acrobat Reader in order to be viewed. Please review the information on downloading and using Acrobat Reader software. AllNutritionals.com - Includes information about vitamins, minerals, herbs, bee products and antioxidants. Beef Nutrition - Nutrient data for the different cuts of beef from The Canadian Beef Industry. Conjugated Linoleic Acids - Information from the University of Wisconsin detailing research papers on this subject. A PDF file of research summaries is available for download. Egg Nutrition Center - Scientific information for nutritionists and health care providers to learn about eggs and good nutrition. Has list of research and scientific studies done an eggs online. The fats for foods consultant - Help to define the best fat for your own food application. Fish Oils - Summaries of the latest research on the health benefits of the omega-3 contentof fish oils. Fish Oils in Health and Disease - Collected articles describing current scientific research relating to the benefits of fish oil and fish consumption, including benefits of fish oil for various conditions and diseases. Food Additives and Ingredients Association - Includes information on food additives and food ingredients such as enumbers, emulsifiers, flavorings, colorings, functional foods, and preservatives. Food Factor - Featuring headline news articles with commentaries, resources on food and health. Food Find - Nutritional values for common foods. Food Supplements - Information about effects of vitamins and minerals in the body with reference listings for individual nutrients. FoodGenius.com - Discover nutrient contents and see if you're getting the RDA. Foods and Nutrition Solutions - Information on food buying, preparation, preservation, safety, storage, and nutritive analysis. International Council for the Control of Iodine Deficiency Disorder - A non-profit, non-government organization for the sustainable elimination of iodine deficiency and the promotion of optimal iodine nutrition worldwide. 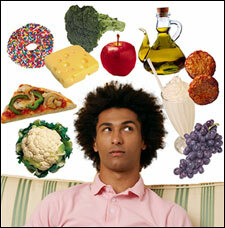 Life Research Universal- Health Department - Has listing of foods with saturated fat, cholesterol, and calories. Provides menus with fat and caloric content and nutritional values. Loders Croklaan Lipid Nutrition - Supplies products resulting from an intensive lipid research program dedicated to delivering lipid ingredients with proven health benefits from natural sources. Lycopene - A comprehensive resource on lycopene and its health benefits including current research, media releases, and recipes. McVitamins, Index - Index with extensive lists of popular fad diets, health symptoms, nutrition, and food additives. Meat & Nutrients - Presents nutritional facts on red meat. Offers tables, graphs and extensive information on iron, vitamins, minerals, and fat. Mike's Calorie and Fat Gram Chart - Has calorie and fat gram chart for 1000 foods sorted by carbohydrates, cholesterol, protein, and fat listed alphabetically. Provides health and fitness links. Natural Food: Fruit - Discusses how we came to be eating the small range of fruits we now eat, and the relative nutritional and protective strengths of commercially available fruit. Natural Food: Grains Beans and Seeds - Covers legumes and seeds and their role in the human diet through human evolution. Focuses on the legume, grain, and seed species worldwide, and is particularly relevant to the legume/grain debate in reference to human biochemistry. Natural Food: Vegetables - A discussion of the nutritional values of vegetables during human evolution and today; including the importance of tubers, roots, corms, rhizomes and bulbs during evolution. Extensive notes on wild African, Asian, and European edible plants. NUT Nutrition Software - Free nutrition software for Linux and DOS, which records and analyzes meals with the USDA nutrient database. NutraSanus - Directory of information on nutritional supplements, herbal supplements and health concerns. Nutrient Data Laboratory Food Composition Data - Downloadable data sets prepared by the USDA Nutrient Data Laboratory with nutrient values of foods. NutrientFacts.com - Offers online nutrition tools that generate nutrition facts labels for any food or recipe. Provides a nutrient almanac designed to aid in planning a healthy, balanced diet. Nutrients in Soyabeans - A brief summary on the nutritional composition of soyabeans. NutriSolutions - Information about antioxidants as an alternative treatment for various types of cancer. Nutrition Facts - Information about carbohydrates, fats, trans-fats, sugars, proteins, and other nutritional information about thousands of foods. Nutrition Guide - Information about nutrients in vegetables, green grasses, seeds, whole grains, sprouts, and legumes. The Nutrition Guide - Comprehensive breakdown of all the nutritional elements of more than 6000 foods. Nutrition in Canned Foods - Describes how canned food fits into healthy eating guidelines with discussion of nutrients, and comparison with fresh food. Nutritional analysis software - Developer of nutritional analysis software. Includes WISP intake analyser, QBUILDER questionnaire development tool, CARAT recipe analysis. Nutritional Supplements - Information about nutritional supplements such as SAM-e, calcium pyruvate, bee propolis, phosphatidylserine, casein, and chromium picolinate. Nutry: Free Nutrition Software - Free nutrition software based on USDA nutrient database. Phytochemicals: Vitamins of the Future? - Describes phytochemicals, identifies the foods in which they are found, and suggest ways to obtain them from a diet. Phytofoods.com - Provides information on phytonutrients and whole food supplements. Soy Info Online - Information on soy, soy products, and legumes. Nutrient charts for common legumes, discussion of allergies, phytochemicals, and protective effects. Whey Protein Institute - Advocates the use of whey proteins in nutrition. Describes nutrition facts and functions complete proteins have in diet.